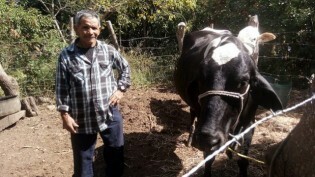 As he milks his cow, Salvadoran Gilberto Gomez laments that poor harvests, due to excessive rain or drought, practically forced his three children to leave the country and undertake the risky journey, as undocumented migrants, to the United States. If you enjoy a good daily shower and water comes out every time you turn on the taps in your home, you should feel privileged. There are places in the world where this vital resource for life is becoming scarcer by the day and the forecasts for the future are grim. Eastern Cuba has suffered drought since time immemorial. But the western and central regions of the island used to be almost free of the phenomenon, until the latest drought that plagued this country between 2014 and 2017. The small pulp mill that uses native fruits that were previously discarded is a synthesis of the multiple objectives of the Adapta Sertão project, a programme created to build resilience to climate change in Brazil's most vulnerable region. At the start of 2017, the Caribbean Drought and Precipitation Monitoring Network (CDPN) warned eastern Caribbean countries that they were facing “abnormal climate conditions” and possibly another full-blown drought. Confidence in large rivers and giant aquifers plummeted in many parts of the world, in the face of the expansion of water crises after intense and prolonged droughts in the last decade. High and Dry: Can We Fix the World’s Water Crisis? April 12 is expected to be the infamous “Day Zero” in South Africa’s second largest city of Cape Town, a tourist hub which attracts millions of visitors every year. In Zimbabwe, the bulk of rural communities and urban poor still get their energy supplies from the forests, leading to deforestation and land degradation. A landmark programme to combat drought set to be implemented in the small Central European country of Slovakia could be an inspiration for other states as extreme weather events become more frequent, the environmental action group behind the plan has said. Grasping its limp leg, a woman drags the carcass of one of her few remaining black-headed sheep away from her family’s domed shelter fashioned out of sticks and fabric that stands alone amid the desiccated scrubland a few kilometers from the town of Dolo Odo in the southeast of Ethiopia near the border with Somalia. Since 2013, Jamaica’s Met Office has been using its Climate Predictability Tool (CPT) to forecast ‘below average’ rainfall or drought across the island. The tool has allowed this northern Caribbean island to accurately predict several dry periods and droughts, including its most destructive episode in 2014 when an estimated one billion dollars in agricultural losses were incurred due to crop failures and wild fires caused by the exceptionally dry conditions. Displaced pastoralists gather around newly arrived drums of brown water as a water truck speeds off to make further deliveries to settlements that have sprung up along the main road running out of Gode, one of the major urban centers in Ethiopia’s Somali region.